Why Do We Call them "Alchemy Stones?" 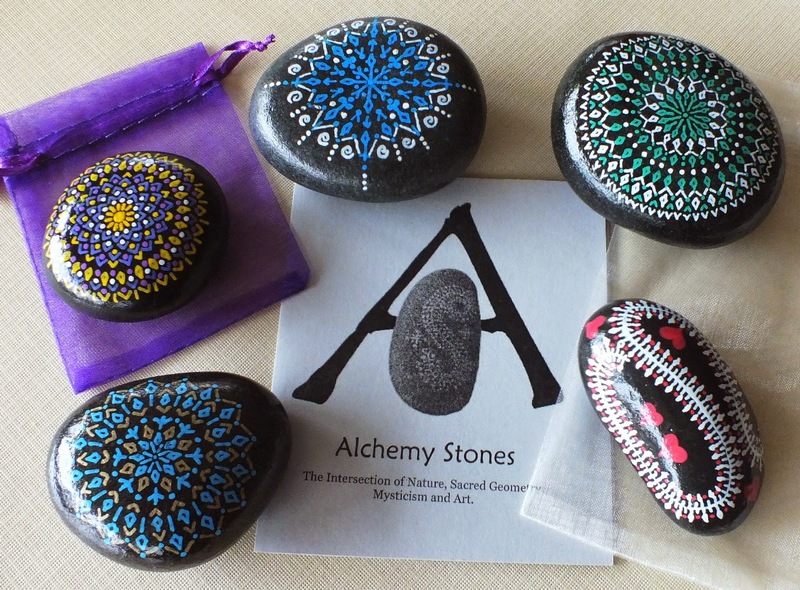 Periodically, the question has come up, as to why we call them "Alchemy Stones," as opposed to something else... like "Beach Art" or "Painted Pebbles." In a historical sense, "Alchemy"-- technically speaking-- was a precursor to chemistry and involved the process allegedly changing (or trying to change) common base metals into gold. In a more loosely defined sense, Alchemy was a seemingly magical process of transformation, creation, or combination of different things that would take something of lesser meaning/value and turn it into something with greater meaning/value. 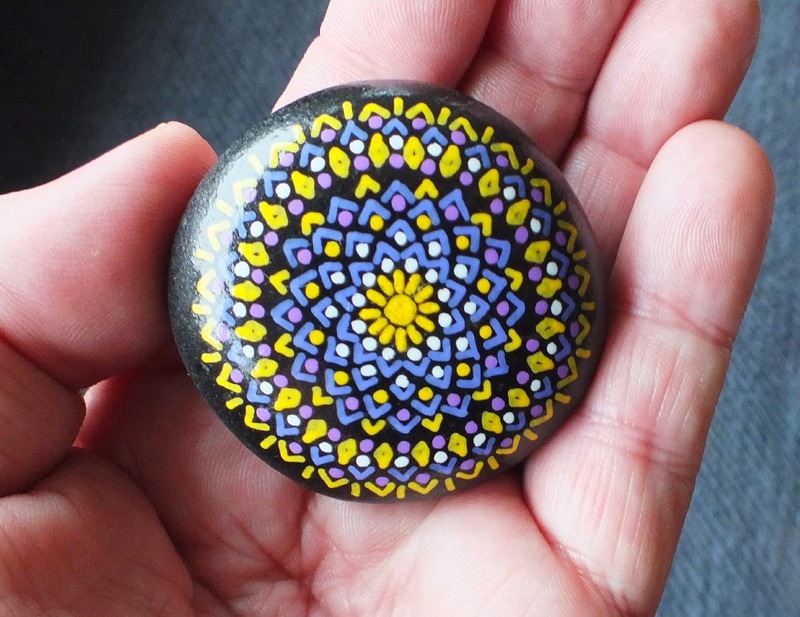 In a very real sense, that's what the process of finding, cleaning, painting on and finishing stones feels like. I start with a beach, filled with an utterly random assemblage of stones, deposited there by tide, surf and time. Out of these millions of stones, just a few of the most appealing ones are selected. They have to look right, they have to feel right in the hand, they have to have the "right" type of smooth surface, they have to have pleasant shapes... already, there is a sort of "quality added" process at work. The actual painting of the stones is both somewhat "magical" and involves a process of "creation." In some strange sense, I literally "interact" with a stone to come up with the design. 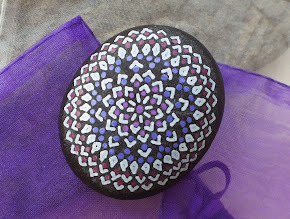 I get some stones home only to discover-- for a variety of reasons-- that they are not "good" for decorating. I can't get a design to "come together" well, or the surface of the stone has a texture that causes the paint to "feather" so the end result is useless. There's also something "magical" about how the designs just seem to "appear" inside my head. I don't have a "plan" for colors or shapes. The designs just sort of... happen. So, a "transformation" definitely takes place. A select few stones are combined with a design idea and "transformed" from "just a stone on a beach" to something greater; something more interesting; something more attractive and appealing. And it happens with a "combination" of factors... my love of rocks, my love of Sacred Geometry, my love of drawing patterns... and then a "secret ingredient" I can't quite describe. "Metaphysical properties" are very difficult to describe... and the process by which they come into being is even harder to describe. What does it mean that a stone has "power?" How do we experience that? As humans, we have kept talismans for millennia because we assign values and properties to them. They become symbols of meaning. Can a priest practice without a crucifix, or a habit, or other "tools of the trade?" Absolutely! But somehow the tools-- the "symbols"-- add more weight to the words; to the lessons. They make us feel like we are "doing it properly." Thus, Alchemy Stones are not only a process of transformation from "something" to "something greater" in their own right, they are created to help others as symbols or talismans for transformation. But then again, you may just like a pretty painted object! The fundamental "stages" of Alchemy Stone creation typically involve finding, washing, designing, painting and sealing a stone. Once the stone passes a final inspection, it is-- technically speaking-- "finished." However, some stones get to move onto a next "stage." This is the stage at which Sarah chooses certain stones to get their own custom made Treasure Bag, which she creates from scratch, from her extensive collection of vintage fabrics. Sarah's Treasure Bags are works of art in their own right... and each one is created specifically for the stone it contains. The bags (sorry!) are not available as a separate "accessory," as she can barely keep up with the "regular" flow of new stones. 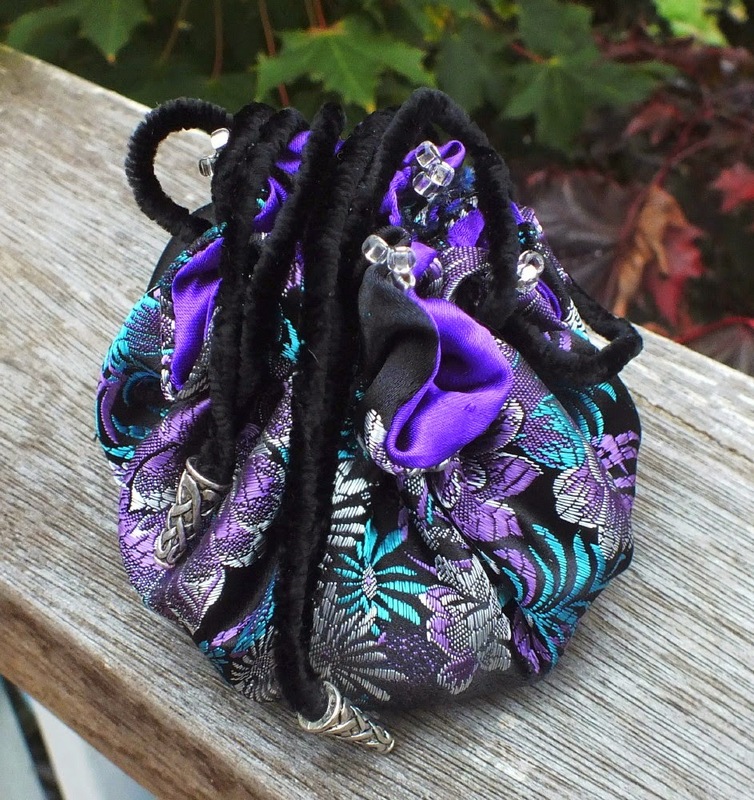 After some experimentation, we have recently finalized our presentation for Alchemy Stones that do not come with their own individually made Treasure Bag. Previously, these stones did not have any kind of formal packaging, and we were not entirely happy with that... mainly because they didn't really "present" well, as gift items. As of this summer, all "regular" Alchemy Stones now comes in an ivory colored organza gift bag, along with an Alchemy Stone "History Booklet," and a signed certificate of authenticity. A "petite" Alchemy Stone comes in a smaller purple organza gift bag, and includes one of our "brief" Alchemy Stone History Booklets. We're pretty happy with how the new "packaging" has turned out. It was an important part of Alchemy Stones to get right. I kept a Fine Crafts gallery and gift shop for many years, and one of the unusual "issues" I often faced was the many talented artists who'd bring in their beautifully made items... in a used old doughnut box with wadded up newspaper. Whereas the "discerning eye" learns to look past poor presentation, we prefer that Alchemy Stones are an "attractive experience" from A-to-Z, so we spent some time working on presentation. Maybe it's silly-- after all, we live in a world where landfills are overflowing wit discarded packaging-- but we believe it's important. And... we deliberately chose a pretty minimalistic form of "packaging."